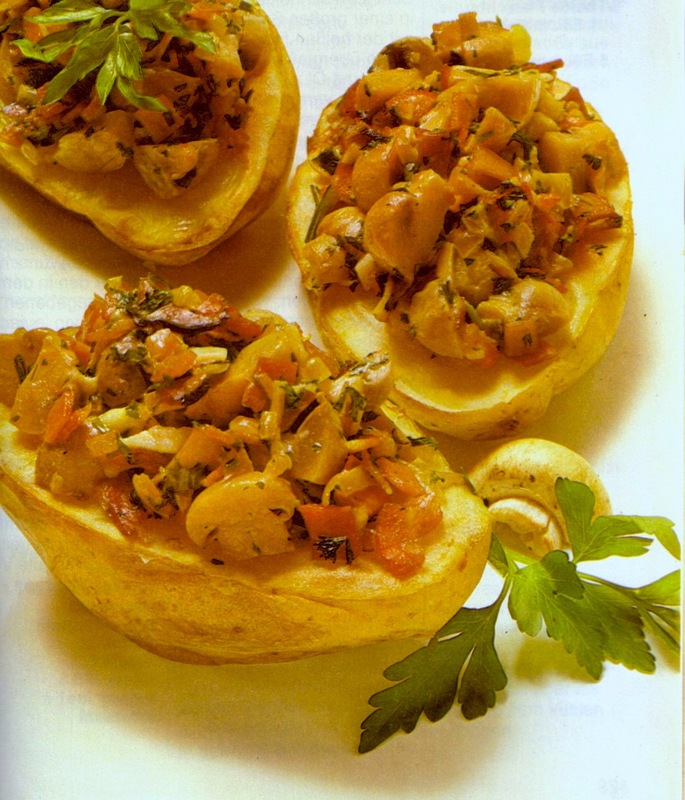 German Filled potatoes are a great alternative to baked potatoes which are very popular in the USA. The filled potatoes are easy to make and the most work does the oven! Happy Cooking. - Potatoes need to be very clean, wash them and brush them, pat dry. - Cut 6 matching pieces of aluminum foil and brush oil on it. - Wrap potatoes loosely in it. - Bake in pre-heated oven on 250 C or 450F for 35 minutes. - Chop onions, add them to the bacon and saute them until transparent. - Chop red pepper; bring water to a boil, place tomatoes into hot water for 1 minutes then with a sharp knife take off the skin. - Cut them in quarters, remove green parts, cut in cubes. - Wash mushrooms and cut them in halves or quarters or slice them. - Add tomatoes and mushrooms to onions and saute it for 3 minutes. - Chop parsley fine (needs to be dry). - Add cream to the veggie mix. - When potatoes are done remove some from the inside of the potato to make some space for the filling. Add the filling. - Brush some melted butter around the potato edges. - Place them again in the oven and let bake for another 15 minutes.